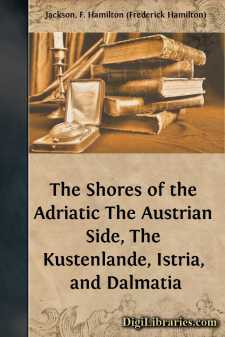 This volume is complementary to that dealing with the Italian side of the Adriatic, and follows much the same lines. It has not been thought necessary to repeat what appeared there about the sea itself, but some further details on the subject have been added in an introductory chapter. The concluding chapter treats of the influence which the two coasts exerted on each other, and contains some hints as to certain archæological problems of great interest, which deserve fuller and more individual treatment than they can receive in such a work as the present. In a country which still contains so much that is unfamiliar, so many mediæval survivals in customs and costume, and so much that is fine in scenery, architecture, and the decorative arts, the picturesque aspect of the country has been dwelt upon more than was the case in dealing with the Italian side, and the meticulous description of buildings has to a great extent been abandoned, except in cases where it was necessary for the full understanding of the deductions drawn from existing details. At the same time, matters of archæology have not been neglected, and the rich remains of mediæval goldsmiths' work have received special attention. The costume, the customs, and the folk-lore of the Morlacchi are also treated of in considerable detail. The determination of the Croat majority to stamp out the Italian language by insisting upon instruction in the schools being given solely in Croat will, in the course of a generation, make Italian a foreign language understood by few; and it seems wise for those who desire to visit Dalmatia to do so soon, while it is still understood and before Italian culture is forgotten.